It’s Take That all over again with “Could It Be Magic”, these working class lads are ‘Back For Good’ and have been performing together since 2006, touring extensively all over the UK & abroad. They have supported many a famous name with their two shows, Take That – Could it Be Magic & The Jersey Boys Tribute – Jersey 4. Stars include ‘Lamar and the Cheeky Girls, Peter André, more recently Paloma Faith, Lenny Henry & Dynamo, they have performed at events with members of the casts of Hollyoaks, Strictly Come Dancing and Coronation Street, graced the stages of several ‘parties in the park & festivals Nationwide and now they are here to ‘Shine’. They are truly talented vocalists and entertainers; they have no problem singing acapella to demonstrate their vocal range and amazing harmonies. A collective of handsome guys with great choreography, energy & enthusiasm and bags of charisma makes for one fantastic show! They have a vast musical background and are no strangers to TV, a couple of the members appeared on X Factor on two occasions, (in various Boy band line ups), where they attended Boot camp. 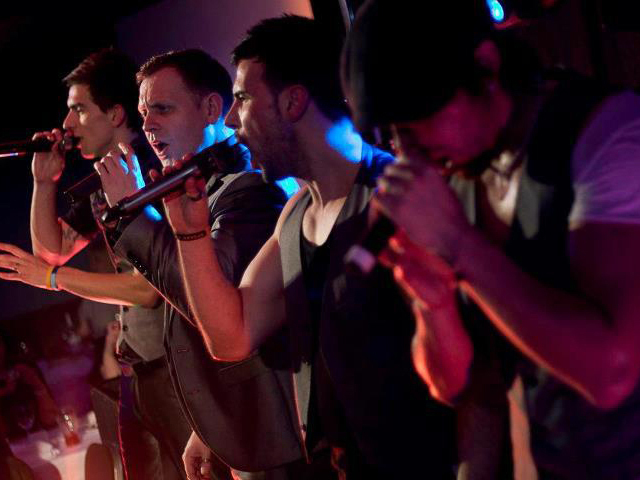 Their harmonising did not go unnoticed and they got down to the last 14 in the boy bands! One of the boys ‘James’ also appeared on Pop Idol in 2002 and got to the last 50 and would have gone all the way had he not had to pull out due to family reasons!